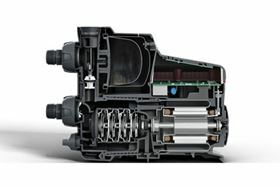 The Grundfos SCALA2 domestic booster pump offers constant water pressure, regardless of municipal inlet pressure and multiple open taps. Fully integrated, the new self-priming SCALA2 is designed to boost water pressure from city mains, shallow wells and storage tanks serving residential buildings with up to three floors and eight taps. An intelligent pump control sensor compares measured and desired water pressures, adjusting pump speed accordingly and ensuring a perfect water pressure through the system. The plug-and-pump solution has a user-friendly control panel to enable manual pressure adjustments. While water boosting pumps can often be large and noisy, the SCALA2 weighs 22 Ibs. and has a silent motor that is water-instead-of-fan-cooled, which results in a sound level of 47 dB(A) - roughly as loud as a modern dishwasher. Danish pump manufacturer Grundfos has officially broken ground on a new 40 000 sq ft office building in Lenexa, Kansas, USA.